The full-bodied Acid Opulence 3 is a zesty and silky masterpiece boasting premium Cuban-seed long-leaf fillers from Esteli and an original infusion of essential oils. A San Andres Maduro wrapper lends an extra bit of strength and a dose of subtle sweetness to this amazingly unique, flavorful, and aromatic cigar. Acid Opulence 3 Toro is a strong, spicy, and floral smoke in a 6x54 Toro Extra vitola. Another drew estate...not expensive good cigar,,tasty..
As with most Acids I bought a 5 pack of Opulence looking for the added taste of infusion . This cigar has a wee bit of sweetness ,just barely enough to taste . The cigar itself is not bad at all for a Nicaraguan puro, however if I am solely buying a Nicaraguan cigar I would lean towards Pepin Garcia. 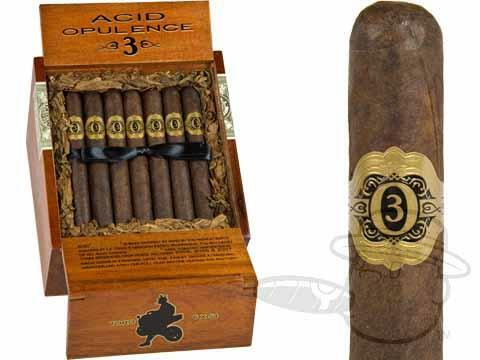 Acid Opulence 3 Toro is rated 4 out of 5 based on 3 customer ratings.